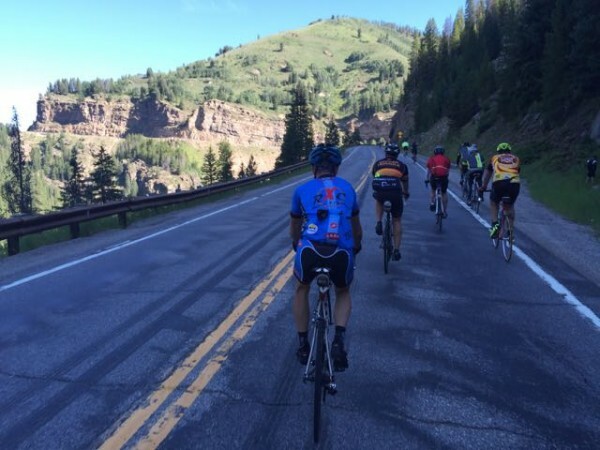 This entry was posted in Comments about Cycling on August 2, 2015 by Steve Tilford. Yesterday was a full meal deal. I got on my bike around 6:30 to meet up with Vincent in Cooper Mountain to do the Cooper Triangle ride. It was pretty chilly, my Garmin said it was around 37 when I got up to Copper, which is about an hour from Silverthorn, mostly uphill. I felt pretty cruddy riding over there. It was a little headwind and I was overfull from breakfast, plus I hardly ever ride that early. And I’ve been riding a ton and it finally felt like it was catching up with me. I got up to the start of the ride around 7:40 and nearly everyone had already left for the 78 mile loop. My hands were pretty cold and we started straight up Freemont Pass. Vincent told me he planned to ride hard up all the climbs/hills and take it easy on the flatter sections. I said great, sarcastically. But, he wasn’t kidding, because within a few minutes, I was riding 350 watts up Freemont Pass. I sat on for awhile thinking that I should just ride my own pace, but in the back on my mind, I figured that Vincent would poop out some and slow down enough to make it tolerable. And he did. But, we keep riding pretty briskly. At the top, Vincent wanted to stop to get some food, since he didn’t have any in his pockets. 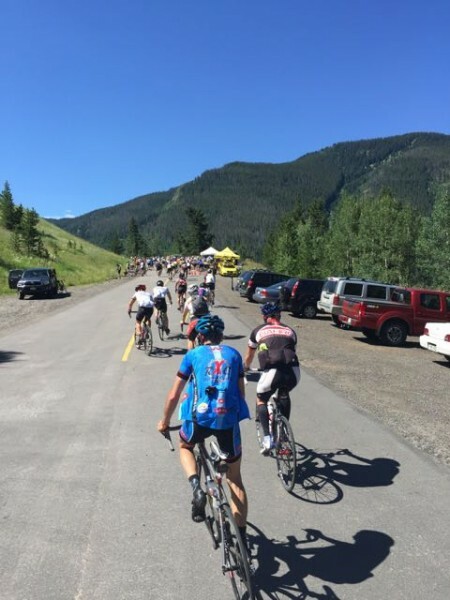 I got a banana and we headed down to Leadville and then back on 24 towards Minturn. Tennessee Pass is there, but it really isn’t much of a climb. After that is Red Mountain, which is a pretty hard hill, but it is really a hill and not so much of a climb. Vincent climbed this off his seat the whole way and I was sort of in pain, once again. The descent off Red Mountain is great. Fast and fun. Then it goes fast thru Minturn, back up threw Vail, up Vail Pass and coasting back on the bike path down to Copper Mountain. Pretty great loop. I ended up with 111 mile in 5:42. Pretty quick pace considering all the climbing. 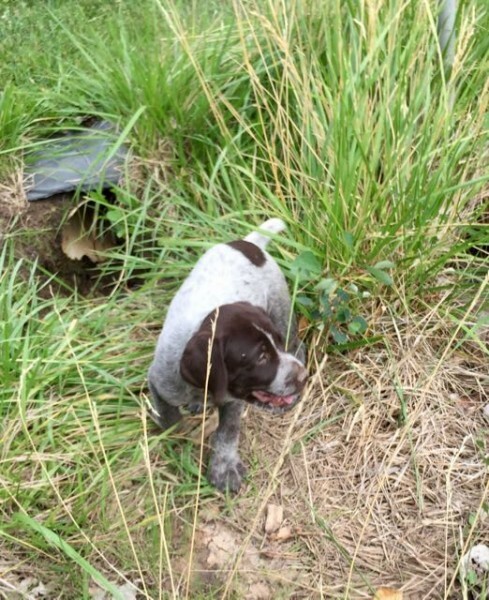 After the ride, I showered quick and Vincent and I drove over to Hotchkiss, CO to check out some Wirehaired Pointing Griffon puppies. It was 3 hours and I still don’t know exactly where we drove. South of Glenwood Springs is all I know. It was a very pretty drive, interesting area. Where the dogs were was an eclectic place. Weird metal art, trout ponds, antique cars, huge seashells. Really interesting. Vincent got a puppy, but he can’t pick him up until next week. The puppy is fearless and adorable, as all puppies are. We got back a little late, so it was a short night. This morning I’m off early again. I’m supposed to meet up with my team mate, Brian Jensen, in Leadville at 8 am and ride the Leadville 100 climbs-Powerline and Columbine. Sounds like it might be pretty hard. Not sure that is what I need to do, but right now it seems okay. I can always just turn back early. Climbing up towards Red Mountain. And starting up Vail Pass. Pretty much a log jam at the bottom, with a sag stop there. 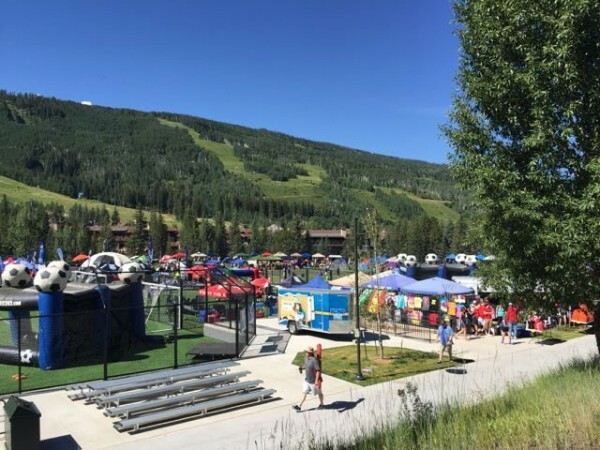 There was a soccer tournament going on in Vail at the Ford Park. This clam shell was maybe a meter across and weighed 210 lbs. Something from the land of the giants I guess. 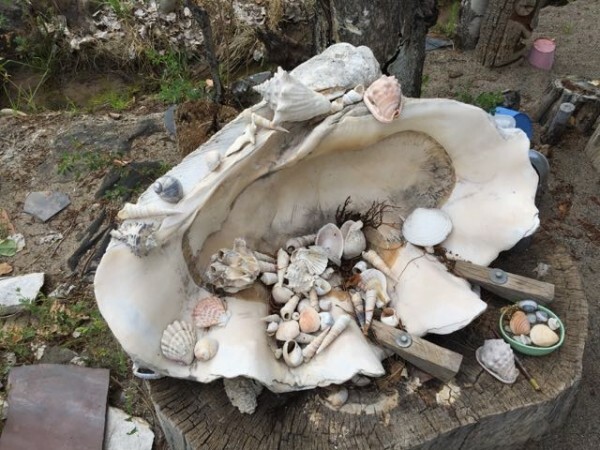 The stain inside the clam shell looks like a goat lying on its side. Steve…..have you gotten a new puppy to replace Bromont yet? You should have raced acoss McClure pass at least twice Steve? Didn’t recognize any of it? This is where the horses got on the course in ’83 I think. The road from Hotchkiss (really Crawford) south to the Gunnison River is absolutely sick. All the sage is red if you catch it in the fall. If he’s driving back out there to get the pup you should take road bikes and just do and out and back to the dam. Look at it on Google earth especially the last 15 miles. Will this help cycle safety?